Do you want to hear something unthinkable? My husband doesn’t love Cadbury Mini Eggs. . . .GASP! I mean, he likes them, but he could take ’em or leave ’em. I can’t even wrap my head around that because I am a mini egg addict. They are probably my favorite Easter candy, or at least they tie for first place along with Reese’s Peanut Butter Eggs. I honestly think my husband is the only person I know who isn’t whole heartedly in love with them. I just don’t get it. Do you know anyone who doesn’t absolutely love them? I eat one and can’t stop. A couple days after Easter last year I was at Walmart and a lady had 30+ bags of them in her cart. She told me she read on the internet they weren’t going to be selling them in the United Stated next year so she was stocking up. So I did the same thing and stocked up. Well they’re on the store shelves this year which should tell you that you can’t trust everything you read on the internet. . . . . Phew!! I couldn’t let Easter go by without making something with one of my many bags. 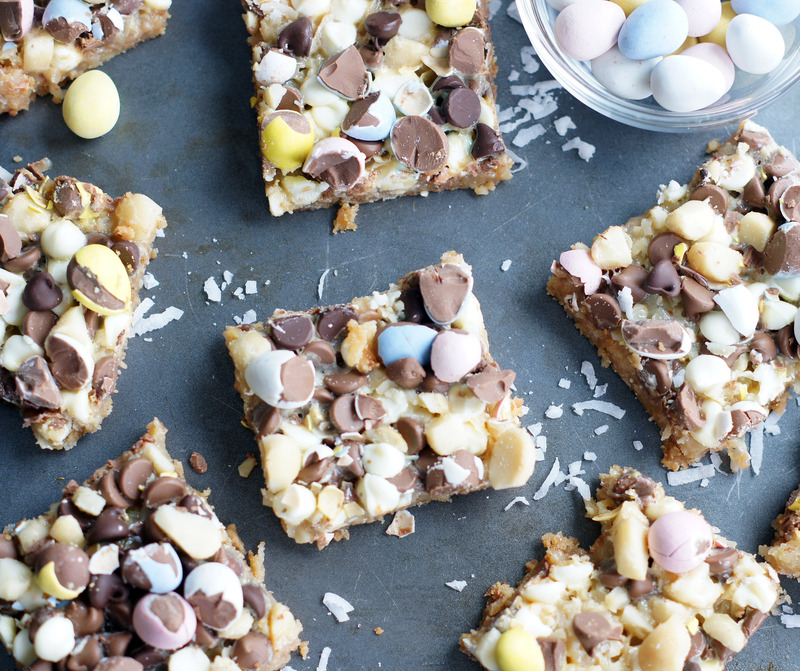 I love seven layer bars because the options are endless and these Cadbury Mini Egg Seven Layer bars may just be my new favorite. At least for now anyway :). So let’s talk about these bars. I had a box of Nilla Wafers that needed to be used up so I did a Nilla Wafer crust. Feel free to stick with a graham cracker crust if you’d rather. I just added melted butter, no sugar, and the crust was amazing and plenty sweet. Then I sprinkled some yummy coconut over the crust and then poured an entire can of sweetened condensed milk (truly is there anything better?!). 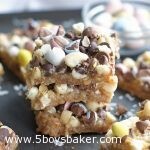 The chocolate chips were the next layer followed by some chopped macadamia nuts just because I happened to have some. I love the little bit of saltiness they added, but feel free to swap out for a different nut or just leave off if you’d like. And for the grand finale I chopped up mini eggs and sprinkled them all over the top. Completely rich, decadent, gooey and just ridiculously good. 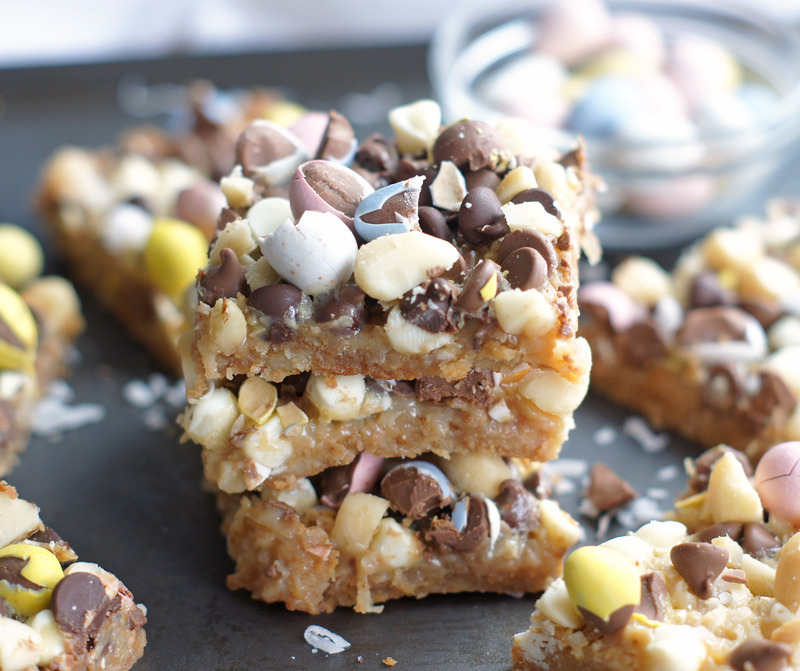 So if you’re like me and have a bag or two of mini eggs laying around, then run to your kitchen and make these. Preheat the oven to 350 degrees F. Lightly spray a 9x13 pan. Place Nilla wafers in a food processor and pulse. (You can also crush them in a large ziploc bag). Add melted butter and mix until well combined. Press the Nilla wafer crust down evenly in the bottom of the prepared pan. On top of the crust, evenly sprinkle the coconut. Then pour the sweetened condensed milk, being careful not to get it too close to the edges of the pan. 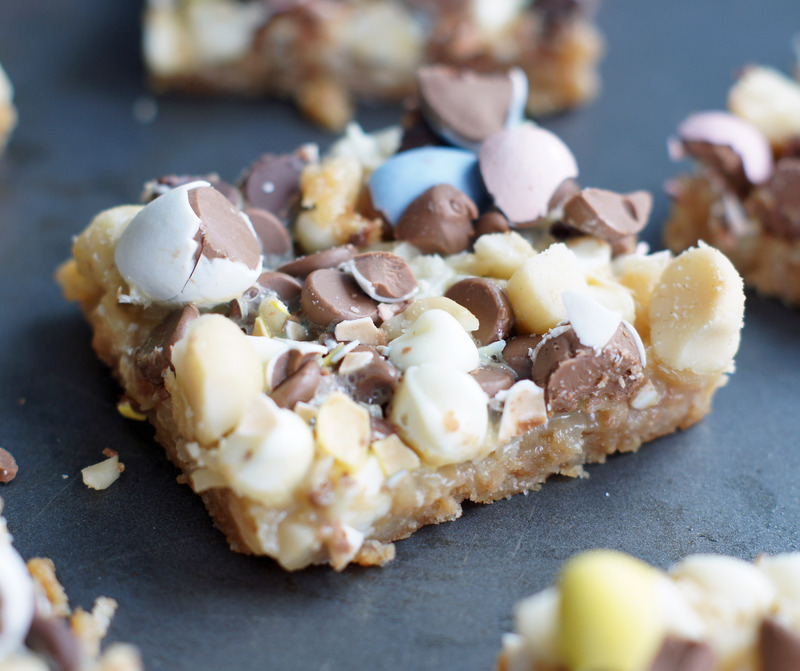 Sprinkle evenly the chocolate chips, nuts and Cadbury Mini eggs on top. Candybury Mini Eggs are a bit tricky to chop because they roll all over the place. To make it easier and keep them from rolling, I put mine on a clean towel and roughly chopped them. Be extremely careful chopping them, because even on a towel, they're a bit tricky to chop. You could just put them in a Ziploc bag and wack them with a rolling pin or something, but I didn't want them chopped to small. Do whatever works for you. Also, feel free to use graham cracker crumbs in place of the Nilla Wafers. Ohhh my. I have 6 bags in post-clearance stock-up right now. I might need to sacrifice a bag for these!! You definitely should sacrifice a bag! I bought 10 bags the day after Easter. . .I am so addicted! Hope you have a chance to make them! !